“After his presentation at the Hiéron du Val d’Or conference* (see below), the Baron went to ground under the direct protection and patronage of Miró i Trepat. A few days later, he moved out of his small rented office in a mansion at No 71 Carrer Vallirana in San Gervasión to more prestigious premises located at the Maison Meuble in the Carrer Santa Ana where he hung out the shingle of his new, discreet, ‘private detective agency’—BK Services (BKS). It was, in fact, a terrorist private army. Bruce and Marshall knew of the web-spinning Baron by reputation—from Paris, Brussels, Amsterdam, Caracas, and London. De Koenig was as much a Baron as I was. 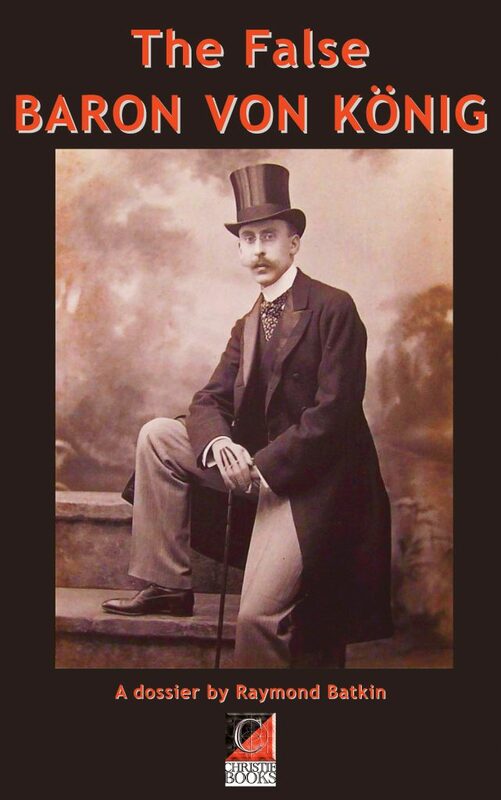 The real name of this latter-day Count Cagliostro was Friedrich Rudolf Ställmann, a forty-four-year-old fraudster, chicane, charlatan, professional gambler, racketeer, carpetbagger, and double, triple, or possibly quadruple secret agent from Potsdam, near Berlin. Known variously as Fritz Kölman, Alberto Colman, Federico or Fritz Stagni, Von Rosbdel, and Colonel Lemoine, he served many masters, the latest of whom was Miró i Trepat. He was also on the payroll of both the French and German secret services—and, although Bruce and Marshall denied it, probably the British Secret Service Bureau as well! No one knew much about the Baron’s background. As with Cagliostro, everything was hearsay. One story had him joining the French Foreign Legion at eighteen to avoid a prison sentence for robbery and murder, and while he was in French North Africa, Marseilles, and Corsica, striking up friendships with local gangsters where he acquired the deadly skills of the milieu, including how to use a knife and kill without compunction. Neither Archs nor Pestaña, old Algeria hands, knew anything about him however. The next anyone heard of the Baron was after his father died, when he settled in Brussels and opened a cabaret club, which he ran for a year before selling and reinventing himself as a professional gambler, acquiring a reputation in the Brussels casinos as an adroit and dexterous card sharp. There followed a number of scandals after which he moved to Berlin where he was arrested on charges of fraud. Released on bail he fled to France and thence to Buenos Aires where he lived for a time under the cover of an Alsatian engineer by the name of Alberto Colmann. 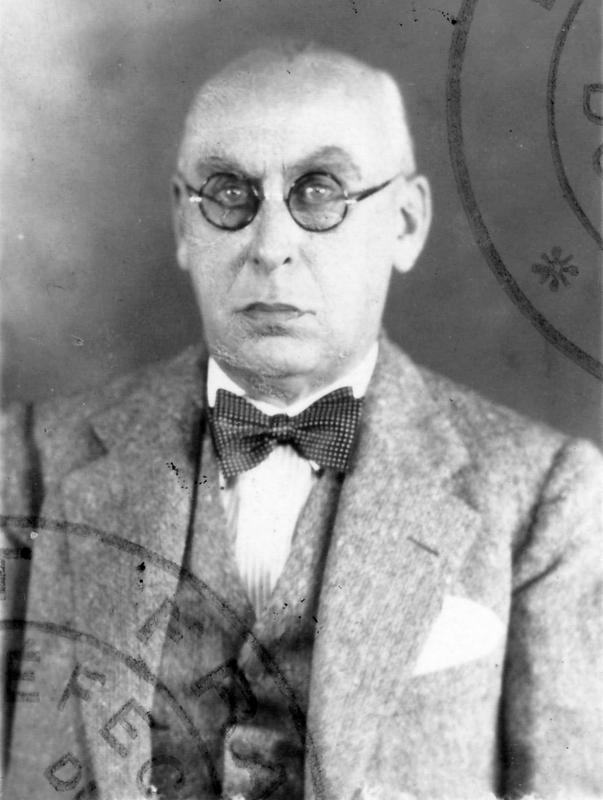 In Argentina, he married Mlle Lemoine, the daughter of a respected Parisian doctor, who adopted the identity of the Baroness Rene Scalda, and whom he introduced into polite Argentinean gambling circles through a Polish Jew by the name of Heinrich Mayer—whom he later defrauded of fourteen thousand pesos. Mayer committed suicide soon after. The ‘Baron’ later turned up in Caracas, claiming to be an official representative of the Monte Carlo Casino, and set up a ‘branch office’ in the Venezuelan capital under the name of Federico Stagni—a venture that attracted the attention of the police who quickly closed him down. From Venezuela he moved on to Egypt, Turkey, Persia, and then South Africa, where he was arrested and held for a time on suspicion of murdering a diamond trader in the Transvaal. Returning to Europe he made his mark as a professional crook and fraudster in London and was eventually arrested under the name Von Rosbdel and deported to Germany, where he was jailed in 1910, this time under the name Baron de Koenig. It was possibly around this time that he was recruited as an agent of the German special services, because not long afterwards he reappeared, a free man, involved with a gang of international swindlers and burglars operating along the wealthy Côte d’Azur in France. He was later sighted in Amsterdam and Belgium where an arrest warrant was issued against him on suspicion of having cut the throat of an undercover Belgian counterintelligence officer in Brussels in July 1914, immediately prior to the German invasion. Bruce and Marshall [MI6/SIS station officers in Barcelona] told me he had offered his services to the British vice consul in Barcelona, though they denied employing him. But they would say that anyway! By the time he surfaced at the Hiéron conference, the ‘Baron’ had been living in Spain for three years, having arrived at the Spanish town of Fuenterrabía, near San Sebastián, on the Bidasoa, the border river between France and Spain, in August 1915, after being expelled from France for various frauds. The likelihood is that he was allowed to escape from France because he was also working for the French Secret Service, the Deuxième Bureau, and had been, apparently, since 1902. He arrived in Fuenterrabía in typically ostentatious fashion, in a splendid red Mercedes cabriolet with a black roof and gold trim, complete with a liveried chauffeur decked out in the same colours. Accompanying him were two beautiful and elegant women: one was his wife, the ‘Baroness Rene Scalda’, and the other his mistress, CJ. Cars didn’t come flashier in those days, nor did their occupants. 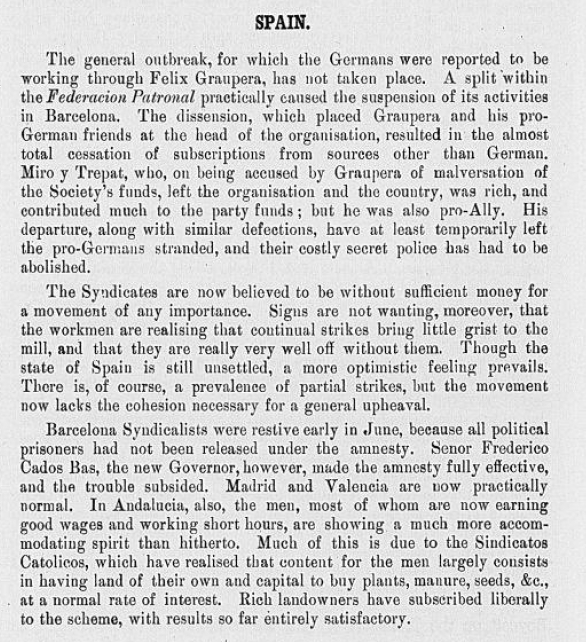 July 1920: British Directorate of Intelligence Report on Catalan labour situation. A charming, charismatic and ruggedly handsome man in his late forties, the Baron was tall, slim, clean-shaven, and tanned with a dress sense that showed a fussy correctness which came perilously close to being prissy. He saw himself, however, as ‘spruce and elegant’. His well-groomed, thick, jet-black hair skimmed the collar of his brilliant-white starched, cuffed shirt and brushed the jacket collar of his bespoke English-cut suit, made from Mongolian cashmere. The suit complemented everything else about him: the monogrammed red silk handkerchief drooping out of the breast pocket, fine handmade Russian leather shoes, embroidered silk socks, elegant watch, and simple silver cufflinks. He had a few slightly nervous traits or mannerisms, such as fiddling with the twinkling square-cut yellow diamond ring which covered the whole joint of his little finger, or the knot of his colourful silk tie, or running his hand over his hair and tucking it behind his ears. An accomplished confidence trickster, it didn’t take ‘the Baron’ long to worm an entrée into the highest aristocratic, financial, commercial, and fashionable circles in town, winning everyone over with his sharp, lightly ironic wit, alert intelligence, apparent social status, cultivated self-deprecating manners—and generosity. His first port of call in Fuenterrabía had been to the Mayor’s office where he introduced himself as a French citizen, and pompously handed over 500 pesetas to be distributed among the town’s neediest families. For some time after, any needy townspeople looking for alms were usually generously accommodated if they turned up at the Baron’s door. His largesse quickly bought him the ‘respect and esteem’ he needed along the length of the coast as far as Irún. He was helped by his enormous vanity and arrogance, and by the Christian names of the wide ‘friendship’ circle of powerful contacts he claimed to have in the chancelleries of Europe, names that he dropped carefully into every extravagant anecdote and conversation. The ‘Baron’ soon became the idol of Guipúzcoa’s middle and upper classes—and the most prized and sought-after dinner guest at the region’s exclusive salons where he gave the impression of having a great deal of money at his disposal. All anyone knew about him, however, was based on the vaguest rumours and stories which either originated with him, his beautiful ‘Baroness Rene Scalda’, or his equally attractive mistress, CJ, all of whom lived together in what was—for the time—an unusually open ménage a trois in the aristocratic chalet they rented in town. Within months of his arrival, ‘the Baron’ had established himself as the trusted confidante of the cream of Guipúzcoa’s ‘movers and shakers’, and before you could say ‘Jack Robinson’ he had been appointed director of Fuenterrabía’s and San Sebastián’s exclusive Casino, a position that gave him free rein to fleece and blackmail the victims of his choice. It also gave him unique access to military and political intelligence, which he was selling on to both the French and German secret services, and who knows how many others. ‘The Baron’ managed both Casinos until mid-1917 when stories about his shady past as a fraudster and card sharp in Germany, Holland, France, and England finally began to catch up with him. 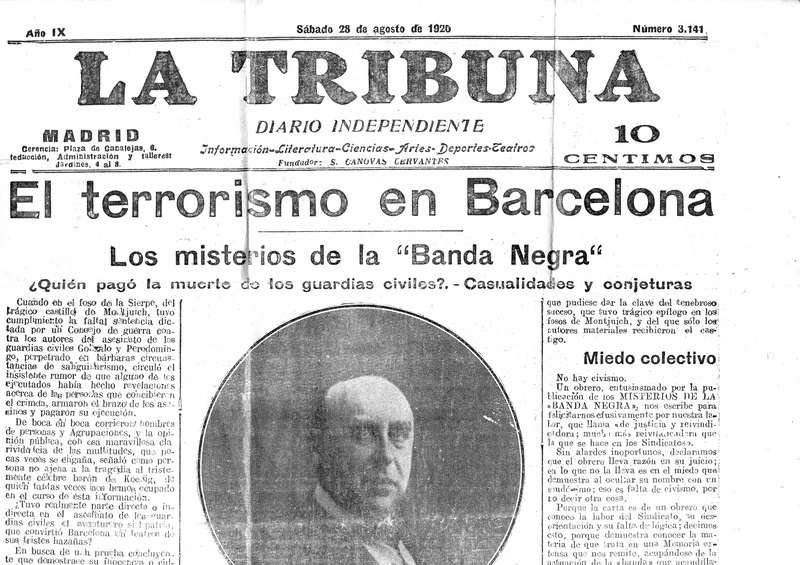 Warned by the local police chief about his imminent arrest, the Baron quickly moved his operations first to Bilbao, and from there to Palma de Mallorca, Cartagena, Malaga, Seville, and Cadiz before finally ending up in Barcelona—the ‘Paris of the South’—in September 1918. Like Milton’s Satan, de Koenig was one of those amoral characters for whom times of disaster and trouble mean opportunities, and Barcelona, a hotbed of intrigue and conspiracy, offered plenty of those! “The cabal of armed and militant ultra-conservative fundamentalists calling themselves the Hiéron du Val d’Or was a semioccult sect founded by Miró i Trepat’s friend and business partner, Baron Alexis de Sarachaga—a charlatan endorsed by Pope Leo XIII. Its members included bishops, cardinals, a clique of venal historians and writers together with a clutch of conspiratorially minded manufacturers, businessmen, politicians, civil servants, and senior army, police, and intelligence officers. Their objective was Europe-wide ‘moral rearmament’ and counter-revolution against the democratic and socialist movements of the twentieth century. Their strategy was to infiltrate and ‘reform’ freemasonry with the idea of ‘fusing the religious passion of the people with the cold power of the State into one great counter-revolutionary force’ that would hopefully shake society to its foundations and somehow stave off chaos. Had their plan succeeded it would certainly have profoundly transformed autocratic Spain and—by anticipating the later phenomenon of Fascism—made it considerably more powerful. Central to the arcane beliefs and esoteric rituals of the cult of the Hiéron du Val d’Or was an obsession with Eucharistic symbolism, geometry, and sacred architecture. It was all nonsense, of course, but the importance of this organisation lay in its political influence, its obsession with the imminent onset of ‘proletarian barbarism’ and the prevention of the catastrophic happenings prophesied by ‘Our Lady of Fatima’ in her brief appearance as a vision to three young children. It championed the cause of ‘returning Europe to the original nobility of purpose and spiritual primacy of a Catholic Christianity modelled on the old Holy Roman Empire’. The thrust of Hiéron du Val seminars and conferences wasn’t simply to dissect and counter Masonic, Bolshevik, liberal, or anarchist ‘subversion’ and ‘contain’ the advance of Godless communism and ‘Masonic free thought’, but to actually confront the enemy by launching a four-hundred-year rollback. It was what they euphemistically called ‘expanding Catholic values’, ‘mobilising true faith into action’, and ‘spreading the social reign of Christ’. People like Miró and Milans del Bosch weren’t interested in negotiating with the modern world; only ‘extreme measures’ could halt the onward march of liberal interventionism and the working-class militancy that was challenging the foundations of belief on which the Papacy and the Monarchy were built. What society needed, they believed, was a purging and patriotic ‘White Terror’. The kernel for this White Terror was already in place in a number of European countries. It functioned through secret, likeminded Catholic army officers’ organisations such as ‘Tradition, Family and Property’ and the ‘Compass Rose Society’, which, in Spain at the time, was headed by ninety or so senior officers representing all the major army regiments and civilian security forces. Central to this Europe-wide web of integrist malcontents was the Hiéron’s ‘Clandestine Planning Committee’, the organisational body responsible for supervising and coordinating resistance to the impending revolution—and for giving strategic direction to its campaigns of terror. With the end of the war in sight, the warnings of ‘Our Lady of Fatima’—herself a prism of signs and wonders—and the smell of revolution in the air, the prophecies of the Book of Revelation were coming true in front of their very eyes. 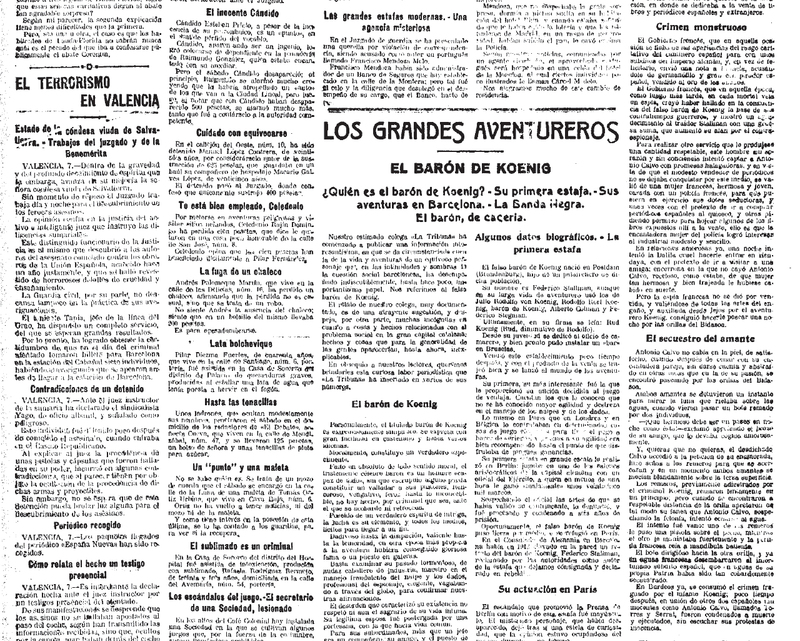 And so, for three days in mid-September 1918, the Catalan chapter of the Hiéron began planning for the postwar world and the fortress of Montjuïc became the venue for a ‘discreet’ international conference on the theme of ‘Bolshevism—An Instrument of World Expansion’. The catalyst for the conference was the phenomenal success of the Bolshevik seizure of power in Russia, and the mushrooming of the CNT following the Sants Congress, which had terrified the bankers and thrown Spain’s urban and landed elites into a real panic. Nominally organised under the aegis of the Fomento Nacional del Trabajo, the national employers’ organisation, the event had in fact been sponsored by the Hiéron and the counterintelligence bureau of the Spanish secret service, with whose members it cultivated close relations. General Milans del Bosch and Guillermo Graell, the Fomento’s secretary-general and Spain’s most prominent ideologue of militant lay clericalism, chaired the sessions jointly. Graell, a reactionary on principle and honest in the service of his class, was the author of a shelf of tracts, pamphlets, and books such as The Religious Question and An Essay on the Necessity to Return to Religion, which expressed the pre-Fascist, integrist, employers’ desires for religious order by arguing for the closest possible ties between the Catholic Church, the workforce and the business community, while extolling the virtues of an idealised lost world, a never-never land in which peaceful, happy, and devout workers and peasants belonged to a trade guild, attended religious processions, confessed and expiated their sins while doffing their boinas—flat caps or ‘bunnets’—to their betters. The ideological stars of the Hiéron conference were an eclectic international group of extreme right-wing journalists, academics, and theologians. Some sought to define what they saw as the present threat to the social order, while others prescribed the means by which it could be overcome. Their enemies were everywhere and included everything and anything that promoted what they defined as heresy or moral laxity, or undermined faith, good order, and discipline. It was a broad canvas that covered science, reason, and even a belief in the goodness of man. In their rogue’s gallery of the Great Beast’s acolytes were such hate-filled blasphemers as Descartes, Bacon, Hobbes, Kant, Leibniz, Rousseau, Hegel, Adam Smith, Michael Bakunin, Pierre Joseph Proudhon—and, last but not least, Francisco Ferrer i Guardia. The study of science and rationalist philosophy, for the Hiéron organisers, led inevitably to heresy via Protestantism and anarchy. Protestantism because it promoted the notion of individualism and resistance to princes on spiritual and temporal grounds; anarchy because it denied the authority of Rome. The Great War will be followed [said one of the keynote speakers at the Hiéron conference] by a social war that will jeopardise the great temporal and spiritual institutions of Europe. Even as we speak, Bolsheviks, anarchists and liberals are capitalising on the instability of the situation. By progressively poisoning the minds of the impatient and enthusiastic poor, radicalising and provoking the weaker members of society into refusing to accept their lot with their normal deference, submission and resignation they are pushing matters to the edge of the abyss. A panel of police, military, and security speakers proposed various strategies to counter the subversive onslaught against family, nation, tradition, and property, but the one that was given the most enthusiastic reception came from a hitherto unknown and new face in town, the Baron de Koenig, who delivered a paper on how to ‘break’ the CNT and end the social unrest ‘crippling’ Barcelona. The threats facing Spain today are real, multiple, and potentially devastating. Unless we exert a strong and ruthless hand immediately, the Bolsheviks and anarcho-syndicalists will soon make totally unreasonable demands upon management and employers in the pursuit of their ultimate objective—social revolution. The greatest danger comes from the CNT. Their leaders are desperate men driven by millenarian faith-based idealism in pursuit of unworkable and ungodly ends. They are a festering sore on the body politic, a cancer that gnaws into the vitals and saps the moral life of Spain. There is no alternative. We have to destroy them physically and psychologically. We are not dealing here with the accommodating union officials of the UGT. These are irrational men. They cannot be bought or brought into the system—nor will they concede without a fight. To sum up. We require a special action service, a clandestine and unconventional body that operates parallel to the official security forces, similar to the Sometent; one capable of organising national resistance to an anarchist or Bolshevik revolution that would provide civilised Spain with a militant bulwark against the Godless hordes of anarchism, Bolshevism, atheism, subversion, terrorism and the new unionism of the CNT. Its role would be to straddle the grey area between the normal military and police operations carried out by men in uniform, and the clandestine political and psychological warfare operations conducted by civilian agents. Its job will be to safeguard the nation’s institutions and maintain the status quo by confronting and neutralising—anywhere and at anytime—the gravest of Bolshevik and anarchist threats. Even if there is no revolution or need for an underground resistance movement, we will still have an instrument of control that will be capable of conditioning the political life of the country and preventing any further advances towards liberalism; an instrument that will allow us to manipulate and control popular mass movements—and, when necessary, eliminate them. When a nation asks its security forces to take on enemies such as the CNT who use terror and intimidation to compel a normally apolitical and indifferent workforce to join its ranks and provoke a repression that will, in turn, outrage national and international public opinion, then the forces of law and order cannot avoid using extreme measures in retaliation. The only way to prevent revolution is to confront the enemy—in this case the terror cells of the CNT and the Bolsheviks—with every means at our disposal. Facing the dangers we face, caution is a luxury we cannot afford. We must treat them as the enemies of humanity that they are—beyond the protection of the law. The courts and the judicial system may not be able to handle them, but we can—and we will! But our intelligence capabilities must be adequate to the task. We need to create an extensive network of informers and agents who will monitor the radicals, dissidents, militants and sympathisers—actual and incipient—and report on all subversive talk, publications, activities and movements. With good intelligence we can manipulate, neutralise and, when necessary, physically eliminate the enemy. We can no longer afford to think in terms of bourgeois morality; we must do what is practical and timely. If you have a gangrenous finger, what do you do? Do you allow the whole hand, and then the body, to become poisoned?—or do you amputate the finger? Our mission demands results, and will require extreme and exceptional measures, but remember—that which corrupts an entire country and its people has to be pulled up like weeds infesting a field of wheat. Some will call us butchers, but get it into perspective, we are butchers surrounded by vampires!